Implementing the Global Agenda: Use of the internet to facilitate information sharing, networking and collaboration. Dixon Sookraj (University of British Columbia, Canada). 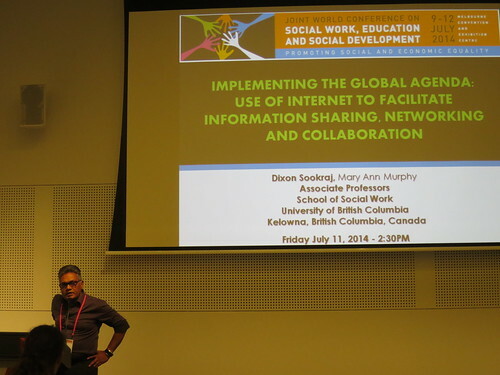 The Global Agenda for Social Work and Social Development is a well-established document with widespread recognition across the world. Its implementation in promoting social work and social development is, however, less obvious. Directions provided by the Global Implementation Taskforce involve establishing “Observatories” in different regions to connect data and prepare reports, which can be made accessible through conference presentations, publications and web sites of the various associations and organizations involved. Lacking in this approach are opportunities for many practitioners, educators, and other stakeholders to engage actively in implementing the Global Agenda. We believe this technology will also help site users identify innovative and successful initiatives that may be used to further education and practice in promoting social and economic equalities along with the other priorities of the Global Agenda.